I had a friend in town visiting me from Chicago so we decided to venture out to Walnut Creek for a girl’s day out including shopping and lunch. I chose Main Street Kitchen from simply the look from the outside and the fact that I hadn’t been there before. I didn’t know anything about the restaurant, we just showed up. The big sign on the outside window advertizing unlimited mimosas did help make the decision I have to say. The restaurant is cute. 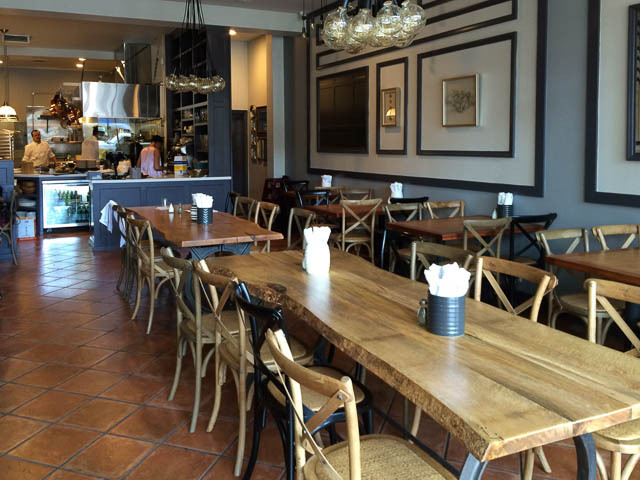 It has an outside little patio area and an open restaurant/kitchen/bistro feel. We did arrive a bit early before the lunch rush so we were able to be seated very quickly. Our server brought us menus and water promptly and he seemed pleasant enough. Looking through the menu, the food seemed like a good selection of pastas, entrees, salads and sandwiches with a gourmet twist. We ordered two mimosas and an iced tea as we selected our food. We all decided on sandwiches that day. 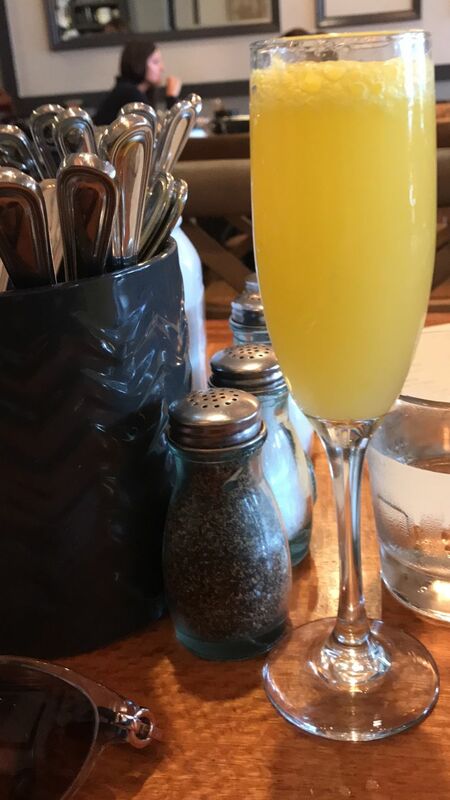 Our mimosas were delicious if you like yours filled with orange pulp and a little heavy on the orange juice. We sipped them while we waited on our plates. The noise level in the restaurant was really loud, even though it wasn’t full due to the layout and we had a hard time enjoying conversation at normal levels. Also, we noticed that the servers weren’t really very attentive and drinks were not refilled. It seemed like a long time to get our food despite not being there during the rush of lunch. When our food arrived, it all looked good with one exception. 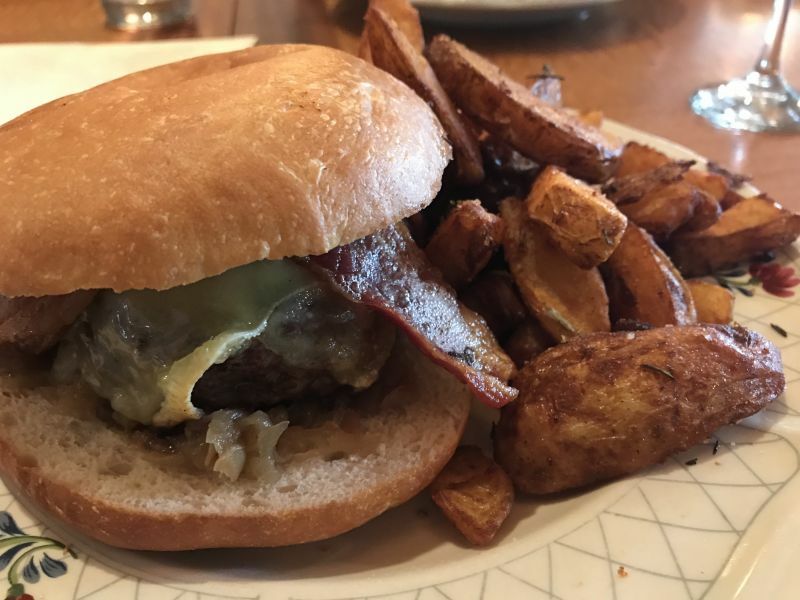 I had ordered my burger with the house fries, but the menu didn’t mention that MSK fries came covered in rosemary. It’s one of those flavors I really don’t care for and it tainted my entire plate. My dining companions too wern’t thrilled as the rosemary flavor was overwhelming to the fries, and not just a hint. 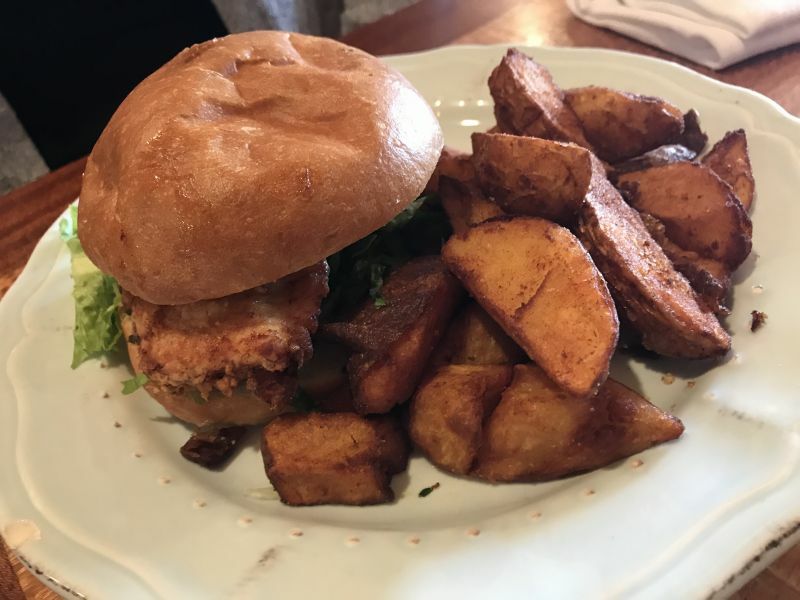 One of my companions ordered the Fried Chicken sandwhich. Whilst the chicken was nicely cooked, she found the sandwhich to be completely dry and bland. We had to ask the waitstaff for their aioli/mayo but the response was neither polite or nor quick so she sat there as her food got cold. I had to ask for it a second time, and the server came back and shoved it her way. There was no apology, nothing. 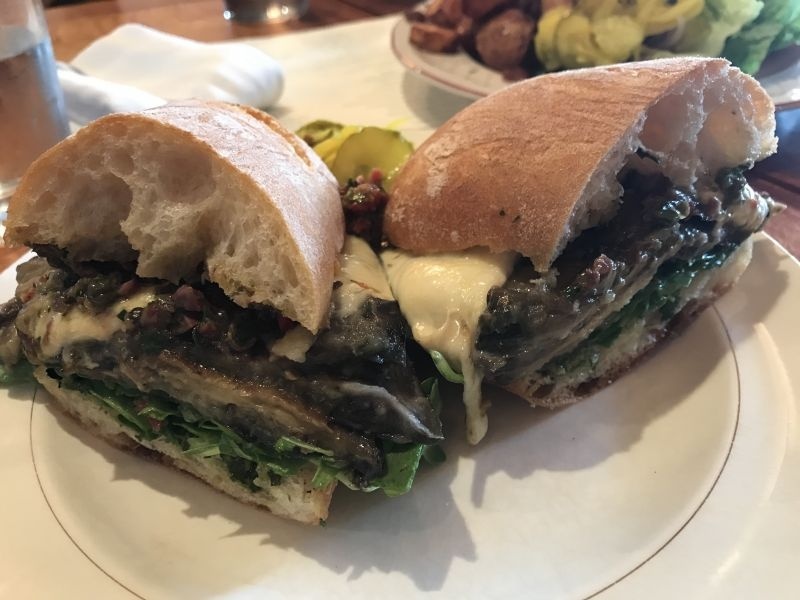 The other diner in our group ordered the Grilled Eggplant sandwich. It was a nice large plate but that too was lacking in flavor. The MSK pickles that were served with it however were awesome and she was just neutral about what she was eating. I think it was my plate that just made me feel overwhelmingly meh about the food that was served. I ordered a simple burger with bacon and cheese on it and it still lacked in flavor. The burger was way overcooked and under-seasoned. I had ordered a medium burger and it was really well done. The bun was way larger than the patty so I felt like the entire thing was skimpy. Again, the rosemary fries were really overwhelming and I just left those untouched. By this time, our service was really poor, and we were all becoming aggrivated. Our drinks hadn’t been refreshed, and the attitude was really lousey. None of us cared enough to stay for dessert. When I got the bill, lunch for the 3 of us was nearly $100! We had 3 sandwhiches and 2 mimosas (which hadn’t been refilled) and an iced tea. Those of you who read my restaurant reviews know that I always try to be fair, honest and polite about our experiences. 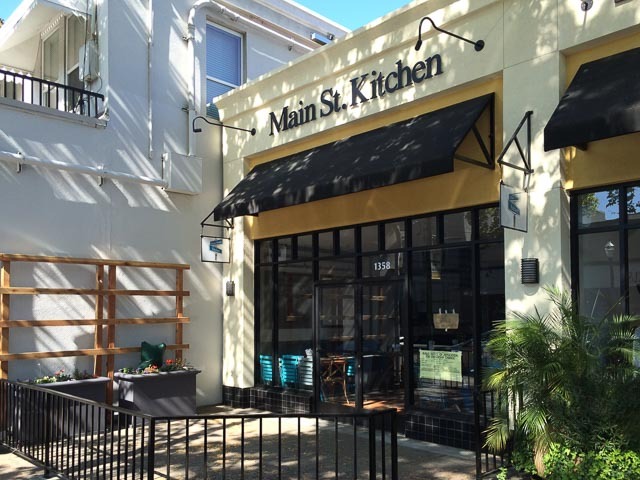 Unfortunately I can’t recommend Main Street Kitchen after our poor experience. Walnut Creek is full of great restaurants and I would suggest you eat at one of those instead. Thank you Lori. We are still trying to get the kinks out!